On June 20th and 21st Kal and I went down to Glastonbury to begin a spiritual pilgrimage. That wasn’t our intention initially, but very quickly that’s what it turned out to be! We had no set agenda, other than a starting point that I had identified after reading Mary Caine’s book about the Glastonbury Zodiac in which she had revealed that the Girt Dog of Langport may have been the first place that initiates to the ancient druidic colleges and mystery schools landed by boat on the Isle of Avalon, the only high ground in the flooded Somerset Levels. This first contact was at Burrow Mump at Burrowbridge. So that was where we started too. From that point onwards I was hoping for some guidance from elsewhere as to the path I should take. Little did I know quite how successful that approach would be! What follows is an account of how we were lead through the Isle of Avalon, each site opening at least one of my chakras, to profound effect. Follow me now as I show you the trail and the experiences I had – truly a solstice to remember. We started the morning looking for the nose that formed the Girt Dog of Langport. Having read Mary Caine’s book about the Glastonbury Zodiac I was interested that she considered it to be the entrance way for the initiate into the Isle of Avalon and the Mystery School transformation process. Not that I was going to subject myself to some sort of masonic ritual! I believe the tradition to be far older than that, and to have been a spiritual initiation of the kind that is symbolically referenced in ancient Welsh bardic texts. Certainly, now that I am recounting this story I feel as though it is the transformation that you seek for yourself that you find, and nothing to do with arcane and involved rituals. Just time, patience, endeavour and a willingness to try. I was not convinced as to the existence of all 12 of the zodiac signs in the Glastonbury landscape (13 including the dog) despite Mary Caine’s well-argued case. I felt that some of the signs were older – especially the incongruous Girt Dog, which equates to the dog Dormarth – the companion of Gwyn ap Nudd. I am starting to formulate the idea that there may have been only five original shapes – the original fixed zodiac signs and the dog, but that’s an argument that I will spell out in another post. The Girt Dog fitted with the Gwyn ap Nudd tales, but was out of place with the zodiac signs, many of whose shapes I feel were a bit ‘forced to fit’. Nevertheless I felt there as something in the Dog, and that it would form a good starting point, as I hadn’t visited it before on previous visits. We bought an Explorer Map of the area and located it. We followed dowsing rods to locate the most energetic paths for ourselves to the top. As usual, Kal’s solar path weaved a little but was almost direct, whereas my lunar-oriented path wandered around ascending at intervals and circling around each of the trees on the slope’s southern side. Then we arrived at the ruins of the St.Michael’s Church on the top of the Mump. If you’ve been reading our posts on this site for a while you’ll know the significance of St.Michael – the archangel of Christianity who pins the dragon energy, or Dark forces, under his sword of Light. However, another way of seeing it, as I saw it that day, was that the Archetype of Light was dominating the natural balance of energies. There ought to be a constant battle between Light and Dark, as is the flow of the forces in Nature. To dominate and subdue the dark forces throws the human world into a state of imbalance. This is how I felt standing in St.Michael’s Church on Burrow Mump – the earth and radiant energy forces were being subjugated by the design and designation of the church. The design channelled the energies, whilst the designation ensured that generations of believers would imbue the site with their dedicatory energies, maintaining the imbalance in the name of the Light (the Sun, the Male force). Is not Christianity just such a religion? Does it not promote The Light and seek to eradicate The Dark, vilifying it as “evil” and un-holy? Has it not tried to associate all the worst aspects of humanity with the forces of darkness, of night and of magic? The result has been 2000 years of what Terence McKenna would call “the dominator culture“, promoting masculine ideals, favouring male energies, denigrating and subjugating the feminine. Only now is the tide slowly turning in the last hundred years as we slowly transfer alignment to the new Aquarian age from the Piscean. For the established Christian Church trying to maintain masculine sun energy exclusively in the face of this turning tide will bring about the dissolution of these established institutions – unless they can change. The St.Michael church was of course aligned East-West. It could hardly fail to be so. Having read Ross Nichol’s article about the layout of churches in the selected collection of his works called “In The Grove of the Druids” I knew that this ancient Sun alignment was important, as was the structure of the church, which also conformed to the divine proportions and layout of almost all early Christian churches. It also happens to be on the St.Michael ley line that the late John Michell re-discovered, and which was popularised further by Hamish Miller and Paul Broadhurst. We set about discovering the ley lines and earth energy formations of the site. We immediately identified a strong and powerful ley line consisting of neutral, male and female energy lines. It travelled all the way through the large empty windows set into each end of the ruined church. We quickly found our respective power centres – on opposite sides of the church’s North-South walls. Mine was to the south, and consisted of female and neutral energies, whilst Kal’s was directly opposite on the northern side and registered for male and female energies. I took the picture below whilst standing in my power centre, and Kal’s was just through the arch on the opposite side. There was also a power centre slap bang in the centre of the church. This was very interesting indeed – we learned something new here. The three types of energies coming into the church along the East-West axis was hitting a female earth energy point in the centre of the church. As it did so it split into two rays that were channelled by the church’s walls outwards in North and South directions, effectively forming….a cross! To the south this extended through my power centre as a female and neutral line. On Kal’s side (north) the line was refracted as a male and female line. What we don’t know is how the power centres at those points affected the constitution of those lines, but perhaps we can leave that for someone else to determine until we get back there another day? As Kal will no doubt relate he was wearing a bracelet of blue stones. An unusual thing for him to do, as I had never seen him wear it before. Turns out I needed it. I dowsed for which of my chakra points this Burrow Mump energy centre would affect and got a response for the colour blue – the throat chakra. I didn’t have any context for what that might mean, but Kal decided to offer me his blue bracelet. He felt it may help my meditation, so I took it. I used the L-rods to find the point at which I should meditate (something we are getting accustomed to doing now). A point was detected about ten feet away from the central crossing point. If you consider that the church’s design is an elongated cross resembling a human being with outstretched arms (see Ross Nichols’ essay on church design and human proportion) then this point would have equated to …you know what’s coming, right? The throat of course. I only realised this once I came to write this post. My higher self is obviously a lot more intelligent than my normal self. From that spot I could see a visible earth energy line flowing across the landscape to the south-east. It was like a line I had seen before when I ascended from Llandrillo stone circle late one night. A softly-glowing overlay on reality. Quite beautiful and mesmerising. I saw it snake across the Levels towards a hill in the distance. It curled around the hill and out of view but I felt that this hill was the next place to visit. At this point I knew not why – Burrow Mump was our starting point but there was, as yet, no sense of any journey or purpose to our weekend visit. Oh, how that was about to change! When we checked the map to determine where the line went (based on my description) it was pointing at Wearyall Hill (instinctively I knew which hill it was even though I’m not familiar enough yet with Glastonbury’s local geography)! Kal had been meditating on his power centre and had seen a new power centre forming at a spot that my imaginary line crossed, at the south-east corner of Burrow Mump. Kal located it with his rods, and shortly afterwards I did the same. However, the moment we had both recognised what it was, it disappeared! We decided to head for Wearyall Hill and see what we could find. Again – no agenda – no preconceptions. Just following our lines and intuitions. The legendary Joseph of Arimathea Thorn was on this hill. If you are a devout Christian then you may wish to look away now. We found it was not anything to do with Joseph of Arimathea. This was pure legend, probably inspired by the fledgling Christian presence trying to gain a foothold in the sacred domain of Avalon, but as Mary Caine points out quite astutely the huge Roman road The Fosse Way passes very close by to Glastonbury and the Romans were less than tolerant of the Christian community. She makes the point that Romans were highly unlikely to let Christians begin to settle or make religious shrines so close to their major thoroughfare, especially as there was an edict from the Emperor to hunt them down and eradicate this new religious group! The Thorn was surrounded by an iron cage which was containing its energies. We have come across iron cages recently at the Penbedw stone circle and at The Hoarstones in Shropshire. They contain and constrain earth energies, reducing their energetic potential and dulling their aura. The thorn’s aura was only a few feet wide, but when we dowsed for what it would be if the cage was not there it extended out to some fifteen feet. At the North end of the hill, in the quieter part not often visited, I found a power centre in the middle of some nettles (nice). A less than perfect spot, but this was the place that I needed to be to make my next connection, I felt. Kal had lent me some of his crystals (another intuitive decision) and I held them but didn’t feel as though they served any purpose. See Kal’s post for more details on this aspect. During this process I saw a double helix of energy flowing from my sacral chakra on either side and up through my solar plexus, through my heart, my throat, and ending at my temples. As I experienced this double-helix flowing through me I asked for direction to the next site and a thread emerged from my abdomen and swirled off towards the Tor, curling around to land at Chalice Well. Again, I knew where the place was because I could “see” it, like someone showing me a photograph. The destination was clear, even though I had never visited the place before. Before we left the hill we also found a ley line linking The Thorn to a small church at the bottom end of Glastonbury town. We decided to visit this church next, as it was lunch time and we wanted to get to the Blue Note Cafe for a decent vegetarian meal before they closed. On the other side of the church the ley line didn’t seem to go on through row of houses or appear out the back of them. We wondered whether it terminated inside the church? Hard for us to find out because of course this Christian place of worship was closed. Aren’t they all these days? Afraid of their ‘treasures’ being stolen, I suppose. According to some histories St.Patrick and his two disciples gave the order to clear the trees from Glastonbury Tor and re-built the small shrine on the top for Christian purposes. Whenever it actually happened, such a conversion did eventually occur, and today the Tor is clear of “obstruction” to the pilgrim’s path. There’s something inherently cleansing and calming about Chalice Well Gardens. It could be the “no mobile phones” notice (which is, sadly, flagrantly flouted by people desperate to communicate about highly urgent and important issues), or it could be the occasional sound of trickling water, or the collection of well spaced and beautifully appointed trees and flowers. Whatever their magical combination it is the perfect place for contemplation, and so we sat in a small courtyard and dowsed quietly for a while before going off to meditate at The Well and the gardens above it. This felt like a cleansing and connecting phase. When I stood in a small shrine near to the main well I felt my heart chakra open up and soothing emotions flowed in and through and out of me. I also felt the water pulling any non-balanced energy out of me and flushing it away in the water. Two chakras were being worked on at once here, and soon I was cleansed, grounded and balanced in a most delightful way. The double-helix energies were flowing into the ground and being drawn back in afresh through my open heart chakra. None of this have I experience before. It was truly amazing. We meditated again under some trees at the top of the Chalice gardens and felt very balanced and connected to the land. Kal then went to sit under the Holy Thorn tree, although he had no idea that this was a famous tree, or even what variety it was. Whilst he did that I measured his aura – it was expanding continually and ended up being thirty feet wide! I understood that all the meditations performed this day had involved twin energies. I felt this was connected to me progressing to the second stage of druidic development: the Yew stage. Up to this point I had ignored yew trees, being quite wary of their supposedly awesome and frightening power, and the fact that they were connected to death. Now I no longer felt that trepidation, and actively went to sit between two large yew trees. I meditated between two yew trees – deciding that it was time to overcome my fears if I was really at another level of development. I felt comfortable, and was told by the trees that their purpose was to teach me, and that I should not be scared. They told me that I had indeed moved on to the next stage of development, and that this would entail an understanding of death, rebirth, transformation, and overcoming fear – that this would involve great personal inner strength to be found, and would take several years to achieve. Satisfied with this I asked for the next connection point on my pilgrim trail and out of my heart chakra a line moved around the base of the Tor (now clearly visible only hundred of feet away) where it seemed to stop on the southern side near to the bottom of the path. In my mind’s eye I saw the path split both ways around the Tor whilst the main path continued up. This was the point I needed to go to next, although I didn’t know what I would find there that could be considered an energy point! As Kal vaulted up the Tor I knew that I was not to follow – yet. We had reached a point where the paths around the Tor became flat and defined and the main path snaked into the upper distance. I was following the rods to identify the exact place I needed to be at. They stopped at the second round stone up the main path: one of the so-called Dragon’s Egg or Omphalos stones! I sat astride the second stone along the path and watched people ascending and descending. A girl with a hula hoop walked past and I made a comment on how unusual that was. She smiled knowingly – now I know why (see Kals’ post). 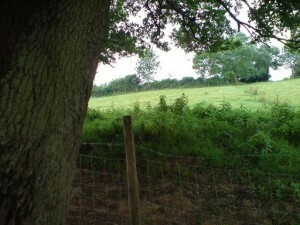 In the gaps I did some dowsing of the energies, finding the power centre and its nemeton. I found a rose petal pattern that wound around the stone in four concentric lines. Each spiral was increasingly shaped into the pattern of a trefoil – a three-leaf shape. I asked for it to reveal the energy formation that was its genius loci, the spirit of this stone. I then dowsed the pattern to find it was a spider shape – three fat legs on each side of the stone, coming back close to the stone at its head and tail ends. I meditated again, gazing at the Somerset Levels and felt a tug at my centre – my solar plexus. A spiralling coil of entwined male and female energies that flew out of my solar plexus and snaked far into the landscape, touching all the places I had visited on my pilgrimage so far. I knew that this chakra centre was the source of my energies. It was my connection point or interface with nature, and the place where I generated and collected energy. All this I just suddenly knew – no train of thought was necessary. I followed the trail back towards me from the distant Burrow Mump and observed where it flowed after the Dragon’s Egg upon which I was now perched. It swept around the Tor’s southern edge and off into the eastern fields. I couldn’t work out where it terminated, but I knew it was a site somewhere over the eastern side, in the fields beyond the Tor. I would have to do some more reading about what might be on that side. After checking into the fabulous Bear Inn at Street we were at a loose end. The sun was still shining and we hadn’t done much dowsing that day. So we decided to head for the nearest stone circle we could find: Stanton Drew. On the way we picked up a stranded biker called Steve and gave him a lift much further down the road. We chatted about stone circles and bikes for a bit, and he was very grateful to be closer to his eventual destination of Bristol. I was excited at the prospect of visiting this circle as I had heard it mentioned many times in books as an example of a double circle. When we arrived in the fading light the stone circle looked disorganised – stones seemingly at random. There were cows and cow pats everywhere, and also quite a few people milling around considering it was 9 o’clock at night! “There are three stone circles at Stanton Drew: the Great Circle being one of the largest in the country. The other two, to the south-west and north-east respectively are smaller. Both the great Circle and the north-east circle were approached from the north-east by short `avenues’ of standing stones. Most of the stones have fallen, although a few still remain upright. In the garden of the village pub is a group of three large stones called The Cove, and to the north, across the river Chew, is the site of a standing stone called Hautville’s Quoit. Kal didn’t do much dowsing and didn’t like it much. He went around the outside of the larger circle and counted 27 stones (most missing). Notice in the diagram above that English Heritage suggest 26 original stones. Personally, I’d trust the dowsing! We strode to the far end where a smaller and more complete circle existed. Kal climbed a male King Stone that had been re-sited inside the circle. He had found another one earlier and climbed and jumped off that too. He didn’t like the rest of the circle or any of the other circles either. I, on the other hand, was quite content to be there. It felt good – I was getting good vibes from the site. When I dowsed the gender of the stones themselves they almost invariably (King Stones being the exception) returned a female response. This was a giant female energy site – no wonder Kal felt uncomfortable – he’s male-aligned. We got talking with a chap and the girl he was with and they quizzed us about dowsing, then had a go themselves with great success. Later they would be seen running naked around the smaller circle while we ignored them and continued dowsing. I asked for the genius loci of Stanton Drew to reveal its shape, dowsed for a good position for this, and then dowsed a beautiful paisley pattern teardrop shape containing seven female spirals that wrapped around a female power centre. I got the idea this site was female!! In the diagram below the black spot is the power centre (a particularly energetic place, sometimes a crossing point for a geological fault and water – often called a ‘blind spring’ or ‘aquastat’). You can see a number of spirals curling first one way then the other to join up again forming a continuous circuit of female earth energy. Kal had been walking around counting stones, doing his own investigations, so I called him over to help me put pegs in so that I could draw out the shape I had just dowsed. Kal was disturbed – he had got obsessed with one particular stone that was heavily cup-marked and seemed to have a lichen face that was discernible if you unfocused your eyes, like a Rorschach Test for the visually impaired (see post ‘Rorschach Mind’). He thought it was draining energy and kept trying to convince me that it was a bad idea to be standing anywhere inside its influence, which he had determined was the whole site. I dowsed for my state of health and as to whether this stone was draining me, because we had found stones like that at places like Nine Ladies and Arbor Low in Derbyshire. I didn’t get negative or malign responses though. Yes it was draining me, but when I willed it – I was draining it too. Together the stone and I were cycling energies between us in a circular arc shape. This fun over, we departed. Kal had become quite argumentative in the presence of this stone, and insistent that I was in peril from it. Later that evening we argued forcibly about our findings at Stanton Drew. The next day Kal apologised for being so “off” and was certain it was due to the stone’s influence. It was certainly out of character. That same evening at the hotel he had an incredible experience with a dream and an encounter with an apple tree, but that’s for him to tell you about in his own good time. Let’s just say that he’s entered into the world of tree learning proper, now! And that was the end of Saturday. Sunday was Solstice, and I was keen to see the two final sights that would complete the spiritual journey that I was beginning to map out for myself. Now I had a mission! But where next? What was on the eastern side of the Tor? I recalled an image I had seen whilst researching Glastonbury of a stylised map of the area (which I now can’t find) and the Gog and Magog ancient oak trees were on that side somewhere. Surely that was the next destination? A quick dowse verified this. Good – now we had a destination for the next bit of chakra work. First thing Sunday morning we visited The Abbey – almost the first there as they opened – and had the run of the place for a short while. We dowsed the Michael/Mary Line and The Great Dragon Line that connects to it. I found its crossing point to be not at the High Altar as I have read in some books, but at King Edgar’s Chapel just beyond the altar. In the abbey the Male/Sun energy was dominant – an ’11’ on the dowsing scale that only goes to ’10’. A cheeky Spinal Tap reference that I immediately understood, and which made me laugh heartily, attracting unwelcome attention. It was at it’s zenith today, and at this time close to noon. It couldn’t be any stronger. The strong male line had pushed the female line to one side of the abbey’s ruins where it zig-zagged its way, a form I haven’t seen before. I suspect it was being constrained and trapped by the power of the male energy and was thus a little more “excited” than usual. I found a female power centre in King Edgar’s which made me relax. I dowsed for a suitable place to meditate and was directed to the base of a big yew tree in the corner of the abbey’s grounds not far from where I was. A yew tree again, huh? No escaping it on this trip! I knew exactly what this meant on many levels, and was stunned by its shocking truth – my father in Australia had been absent from my thoughts of late, but also I knew this to refer to the energies too because I had been neglecting male/sun energy in favour of exclusively female/moon energy recently. Today of all days – the Summer Solstice – when the sun is at its peak this was a gentle reminder that there are three streams of energy: male, female and neutral. I should not neglect the power of any of these and should cultivate a use for all three, with the idea of achieving harmony through balancing their flows – my biorhythms essentially. Ha ha, I know – another flaky pseudo-science! Any tool that helps you understand yourself is useful providing it doesn’t enslave you, wouldn’t you say? I vowed to change that imbalance straight away, so I sent an e-mail from my phone to my dad with a picture of me beneath the yew tree saying “Happy Father’s Day” (for it was conveniently that very day). Then I walked the full length of the abbey’s male stream revelling in the way it made my spine tingle with delight at it enervating force. As I walked to the Abbey entrance a white dove landed a few feet in front of me on the path. I stopped and watched it, knowing it to be a sign that I was on the right path. Perhaps also a sign that my next encounter would involve “white”? I swear the next encounter was not planned! As we travelled up the Tor that Sunday afternoon for our final encounters we came across the White Spring – a place where a natural spring has been channelled into flowing paths through a dark building, lit only by candles and natural light. The name of the spring did not escape my notice : white was indeed the next point on my ‘pilgrim’ trail. Inside the building there was a wicker-work lattice in a teardrop dome shape, within which had been placed scented candles and flowers at one end, forming a kind of shrine or meditation place. It was incredibly relaxing and all the heat was truly removed from any heated debate from the previous evening. We both emerged refreshed and ready for the day after only minutes near those waters. Asked a Tor Bus guide where these famous old oak trees were. We were directed down a land that descended down the other side of the Tor that we had come up from! Oh no! A steep climb down after a steep climb up and on a baking hot day too. We followed the driver’s vague instructions until we thought we’d gone too far. It was past midday and we wondered whether we should be up the Tor by now. We asked the rods where the oak tress known as Gog and Magog might be and both got directed into a field. Luckily Kal found a stile at the bottom of the field labelled “Gypsy Lane” and we saw two trees in the field – one very large oak and a slightly smaller one – surely Gog and Magog? Kal went to the smaller ‘Magog’ tree and I stayed with the larger ‘Gog’. Gog was supposed to be the male, and Magog the female. We had swapped alignments, which was probably a good thing after the Abbey revelation. I communed with the tree and saw my body’s energies emerging from a hole in the top of my head – the crown chakra. This energy spread upwards like a circular fountain until it wrapped itself around me. Next it pulsed out a second time and wrapped itself over and under the surrounding land until it returned to me through my spine. The third time it went right through the centre of my spine like an electric shiver until the fountain from the top of my head encompassed the whole world and then returned up through my spine again, this time almost blowing my mind with its powerful force. I felt that another chakra had opened. I was therefore quite startled to find out that we had got the wrong trees! We were walking back up the hill towards the Tor again when a guy farther down the lane called to us. He introduced himself as Steve (another Steve!) and seemed like a really nice guy. He was looking for some people camped near to a farm, but we hadn’t a clue where he meant. After some to-ing and fro-ing involving other people directing us we found Steve’s camp site – right next to the supposedly REAL Gog and Magog oak trees. Kal didn’t want to hop over the fence to see the trees up close. He seemed to be wandering off in mind and body at that time. I wanted to get close to these very old trees, however. I sat on Gog’s knee first (‘don’t neglect the father’) and felt his wisdom even in his declining years. Earlier I had found a red ribbon and so now seemed like an appropriate time to tie it to his trunk. Then I found a gap in Magog’s bark big enough to place my head in, which I did. In merely seconds I had an image of her wrapping her arms around me and cradling me in her bosom. I can’t tell you how much I wanted to stay there – possibly forever! Meanwhile Kal is having an out-of-body experience that lasts until we get down from the Tor much later. In this experience he hears a woman who is sitting on the nearby hillside say to him “Come and sit here.”. I know nothing of this and started dowsing for the best path up the hill. I follow the male line which zig-zags like the female energy at the abbey in long strokes up the hillside towards the Tor. Part way up I stopped for some reason. Kal then stops and sits whilst I do some dowsing about nothing! I stop dowsing and feel the urge to collect flowers! Yes, you read that right – some flowers, wild flowers. As a sort of gift. My thinking was that I had had such a fantastic experience that I should offer some form of gift, no matter how meagre, as long as my intention was good. My intention was to thank Nature for such an interesting year, and a particularly enlightening weekend – all natural highs and revelations. It seemed in keeping with the festival mood of the town that was preparing itself for Glastonbury Festival the next weekend. Kal lets me collect a posy of wild flowers and then tells me that the place I stopped was exactly the place the woman had been sitting at when he “heard” her call him up the hill. At the time I had my face in a tree surrounded by a high hawthorn hedge, so I didn’t even see this woman, but I had seen some people begin to climb up, so I knew he wasn’t hallucinating. Frankly, by now, little green Martians could have been dancing all around us and I would have been quite accepting of it – my mind was slipping into a beautiful space where I was getting increasingly “blissed out” and random! Our final ascent goes awry. I’m too busy making a posy to navigate and we have to clamber over a high gate to reach the entrance to the Tor. We begin our ascent vowing to go wherever the feeling takes us – deviceless dowsing up the hillside without using the rods. A gamble, a challenge, and yet it felt right. We arrive within minutes of each other. I have been lead all around the North and East sides of the slope. The eastern slop is bathed in midday sunlight and very strong. The path is difficult but strangely beautiful. Not exhausting, just enough of an effort to feel worthy. The sun is beaming and so are we. The ascent up the Tor’s terraced sides has opened the final chakra – the third-eye chakra. Everything feels like I’m seeing it in a dream. We were walking the Glastonbury Labyrinth, only doing the parts of the enlightenment path that we needed to complete our pilgrimage – even though we were completely unaware of where such a path might be – all we went on was “go with the energy flow”. I walked a circle around the Tor clockwise and then laid my collected flower bunch where the rods indicated I should. I stood up and was eye to eye with a word carved into the St Michael’s Church stonework: “Druids”. At that moment something happened. I walked in a daze to the church entrance where Kal and I listened to some lads doing throat-singing and playing a balalaika and bhodran. That set me off a vibration in me that triggered my third-eye chakra to slowly unfurl its petals like some kind of lotus flower. For the next few hours as we wandered around the town I felt like I was in a state of bliss with a paper-thin hat’s brim extending from my lower forehead. I believe that this trip has shown me the veracity and capacity of the chakras within the human body. I had witnessed each of the seven open in turn as I attuned to several sites around Glastonbury in that special Solstice period, guided only by intuition and nature herself revealing thoughts, pictures, visions and lines in the landscape for me to follow. I had been energised, corrected, cleansed, purified, instructed, balanced and opened-up – not necessarily in that order, but the overall effect has been to make me convinced of the existence and usefulness of chakras to the process of attunement with Nature. There is something quite wonderful and special about the Isle of Avalon and its landscape of energies. This much is inescapable. Opening up one by one.